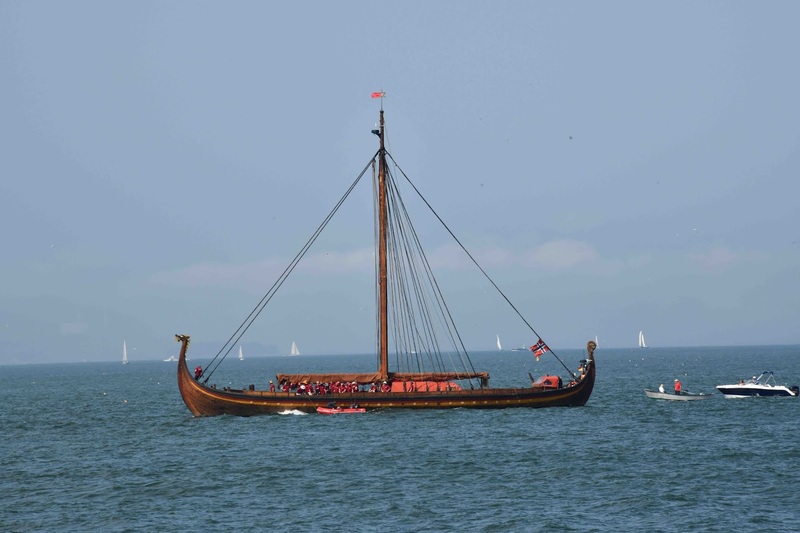 “Do you think an earlier Viking ship looking like that one may have sailed in here a thousand years ago?” I asked the old man sitting next to me on a bench in Bug Light Park last Friday. Bug Light Park looks out at islands in Casco Bay and sits at the southern boundary of Portland Harbor where the Fore River emerges into the bay. 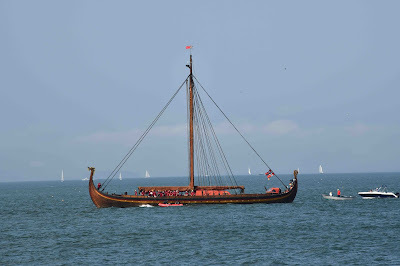 We were looking at a 115-foot replica of a Viking ship called “Draken Harald Hargagre” out near Fort Gorges a few hundred feet away. It had sailed from Norway in 2016 and I’d hoped it would come into the harbor under sail or see rows of oars sticking out each side propelling it, but it didn’t. The old man told me it had twin diesels. 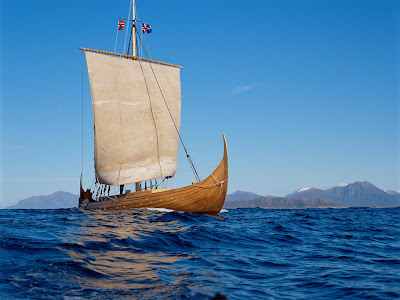 Seeing ships like that on the horizon panicked Europeans for centuries beginning around 800 AD when Vikings raided virtually every coastal and riverine settlement on the continent. 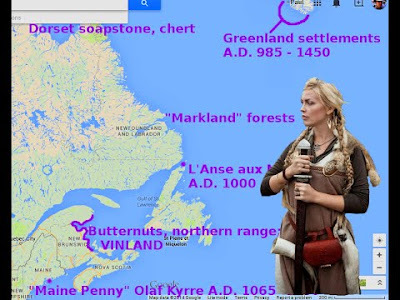 We know about Eric the Red settling in Iceland and then Greenland in 985 AD. We know his son, Leif sailed further south, probably to the northern tip of Newfoundland where remains of a Viking settlement were discovered in 1960 at a place called L’Anse aux Meadows. Excavations around the L’Anse aux Meadows site revealed two discoveries that indicate travel to or trade with areas to its south. 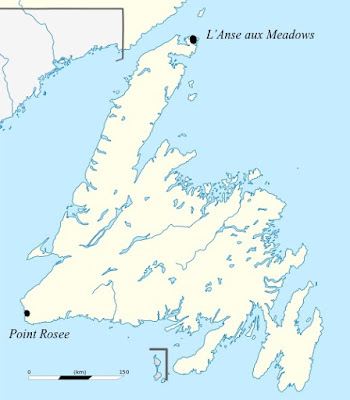 Two pieces of jasper were found that came from Notre Dame Bay on the island of Newfoundland and were likely used as fire starters by striking them against steel to produce sparks. The other discovery was of butternuts, found in trenches dug into an adjacent boggy area and corresponding in time to the Viking settlement there. The northern limit of butternut trees is New Brunswick, 800 miles to the south. Wild grapes grow there too, and the presence of many grapes led to Leif Ericsson calling the new place he discovered “Vinland.” No grapes or butternuts ever grew in Newfoundland, botanists insist. While such blanket statements are risky, it’s probably safe to say that no evidence of them has been found. Vikings living at L’Anse aux Meadows likely brought them back from New Brunswick, Quebec, Maine, or areas even further south. 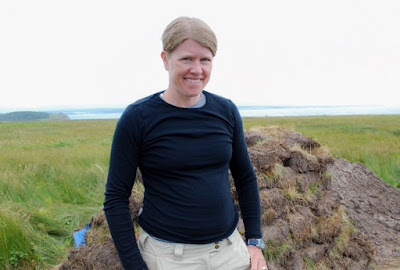 More recently, a Maine archaeologist named Sarah Parcak discovered what was thought to be another Viking site in Newfoundland at Point Rosee, but two years of excavations found nothing conclusive. Parcak had examined satellite photos indicating possible subsurface remains of a Viking longhouse, but nothing like that was found and research has been terminated. According to a 2010 article in National Geographic, about eighty people then living in Iceland “with a genetic variation similar to one found mostly in Native Americans,” and “This signature probably entered Icelandic bloodlines around A.D. 1000,” which is about when Leif discovered Vinland. In 1958, an 11th century Viking coin was found during a Brooklin, Maine archaeological dig at an Indian site. 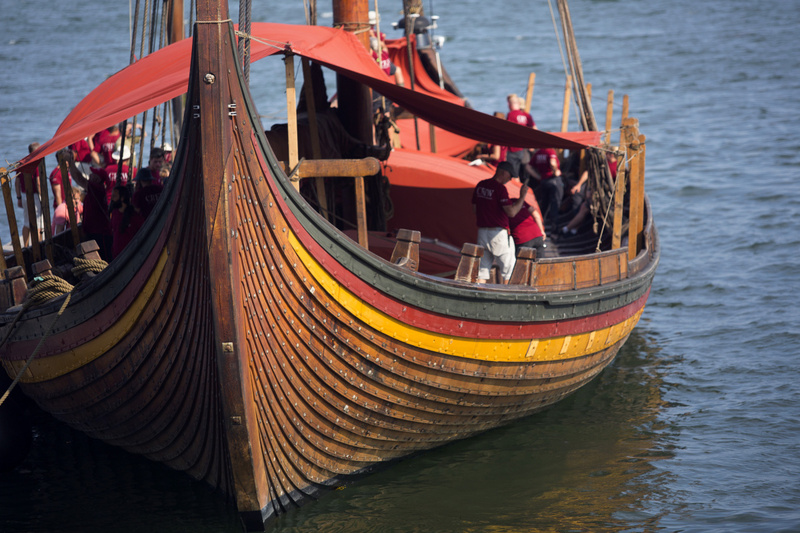 Most believe it got there through an Indian trading network since no other Viking evidence emerged. There have been scattered reports of “runes” carved into rocks in several New England locales, but none has ever been verified. Runes are Greek or Roman characters modified by Scandinavians. 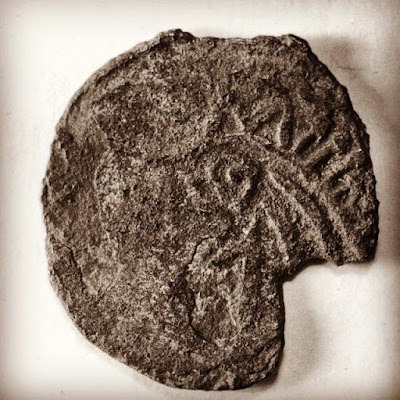 Several years ago I found an Indian artifact near the Old Saco in North Fryeburg that senior Maine archaeologist Art Speiss told me was made of Ramah Chert. 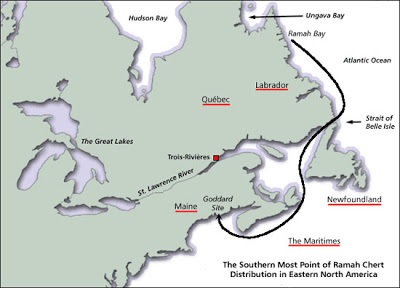 According to geologists, there’s only one source of Ramah Chert and that is in northern Labrador, fifteen hundred miles north of Fryeburg. Ramah Chert has been found as far south as Connecticut on the shore of Long Island Sound. What would account for this? There are at least two possible explanations. 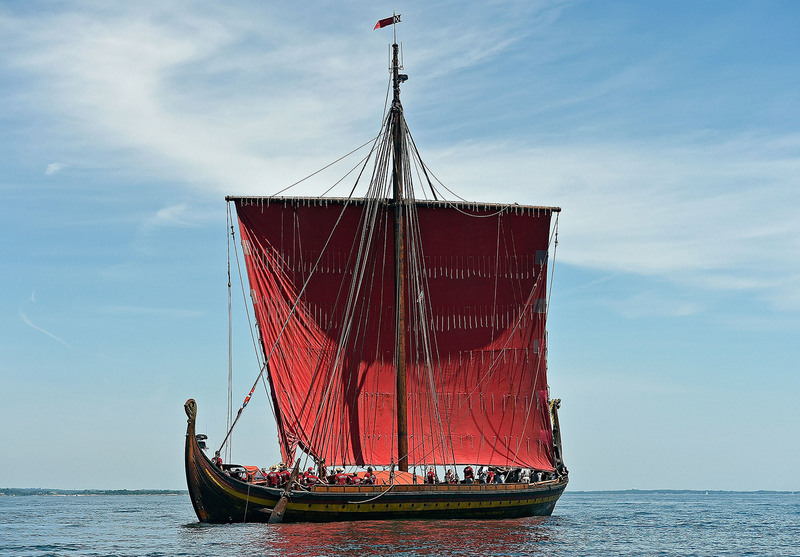 Indians in New England and elsewhere were more capable of sea travel than previously believed and could have built vessels capable of very long sea voyages. The other explanation would be that their trading networks were very extensive. Possibly both are true. 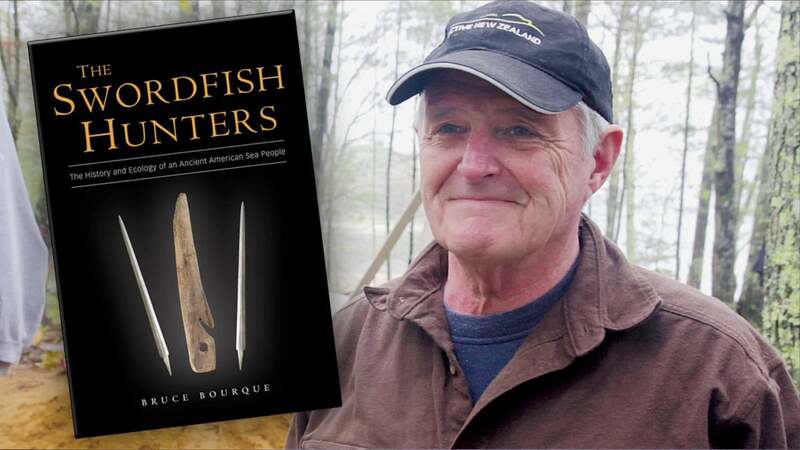 Those formerly called Red Paint people are now called Maritime Archaic and they lived five millennia ago on the Maine coast as far south as the Androscoggin River. They used Ramah Chert, and also hunted swordfish. Both intrepid voyagers, the Red Paint People disappeared from the Maine coast and the Vikings disappeared from Newfoundland, but it’s likely both navigated all up and down the northeastern coast of North America in their day. 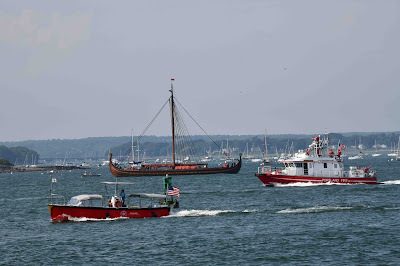 So, is it quite possible the “Draken Harald Hargagre” wasn’t the first ship of its kind to appear in Portland Harbor.